Carnage Blu-ray Review. If you're after a quiet night in than you really should check out Carnage! Carnage is a quirky and delightful comedy by legendary director Roman Polanski that is based on the play "God of Carnage" by Yasmina Reza. It's the story of two couples who meet in a playground due to an altercation with their children. Needless to say a child hitting another child with a stick is an issue of concern which is also the catalyst of this story. From here, the parents of the alleged victim invite the bully to their home in order to work out their differences but it appears that the parents have more differences then their children which turns into an all-out war of words. It's almost like the children become the adults and the adults become the children with their mannerisms. More so because each of the couples lifestyles are so different. The great element about Carnage is the screenplay which is extremely witty and the dialogue flows perfectly. At times, it feels like a Woody Allen movie but this is definitely not the case. Another highlight is the cinematography that uses scenery and ambience of natural light to create this almost surreal comedy which really draws you in. It may not have you laughing out in hysterics but it definitely touches your inner core and you'll be smiling from ear to ear. 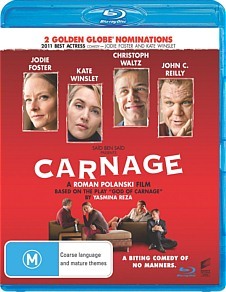 The stars of Carnage also help create this enjoyable film and both Jodie Foster and Kate Winslet as the parents of the two children are a joy to watch. Obviously they have used their own life experiences as parents to help portray their characters of Penelope Longstreet (Foster) and Nancy Cowan (Winslet). John C. Reilly is also quite amusing as Michael Cowan whose character definitely gets pushed to the limits, especially considering his nemesis, Mr. Longstreet (Christopher Waltz). All in all Carnage is a very delightful film that all parents should watch. On Blu-ray, Carnage features some very earthy colours that helps adds to the ambience of the film. Images are extremely sharp and the audio is equally as good. There are a handful of special features that include Actor's Notes, An Evening with John C. Reilly and Christopher Waltz plus On the Red Carpet. It's actually quite interesting to watch the featurette of Reilly and Waltz who play the complete opposites in the film and it's a great insight into the creation of the movie. If you're after a quiet night in than you really should check out Carnage!